Facebook sends you notifications for new likes, comments or posts from your friends either via email or as push notifications on your Facebook page. But it would be more convenient for "Feed Reader" lovers to get these Facebook notifications directly in their favorite reader instead. Feedly being the most popular feed reader, lets see how to get your Facebook notifications directly in Feedly. 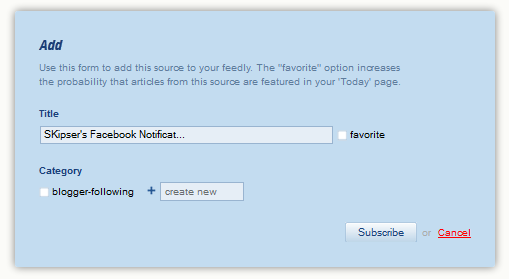 Steps to add Facebook Notifications as RSS to Feedly. 1. First go to facebook.com/notificatons and click on the "RSS" link.From the new window that opens, copy the URL. This is the RSS feed link for all your Facebook Notifications. 2. Open Feedly and click on "Add Website" link on left menu. Paste the previously copied URL and wait for Feedly to recognize the feed. Once done, it will display the feed name with a + sign against it. 3. Click on the + sign, add a suitable category and rename to feed to something of your choice and click "Subscribe". 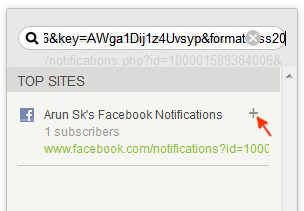 That's it, you are subscribed to the RSS feed of your Facebook notifications with Feedly.